If you have ever been responsible for maintaining ICF catalogs and VSAM clusters, it probably reminds you of playing the arcade game Whac-A-Mole. Just when you think everything is under control, a broken index is detected for a VSAM object. Or, the CA/CI splits you fixed the other day, really didn’t get fixed. Or, the myriad of other fun things that can go wrong decide to do so on a Friday afternoon at a busy time for your company or organization. Can you still remember the feeling you experienced the last time it happened? Dino-Software continues to excel at taking on and easing the challenge of working with VSAM files and catalogs through its T-REX product solution. 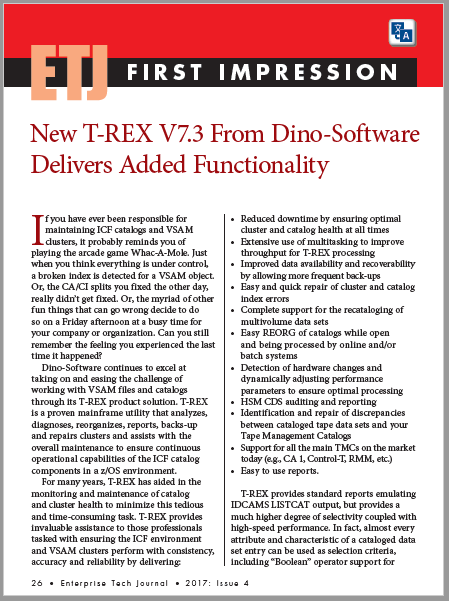 T-REX is a proven mainframe utility that analyzes, diagnoses, reorganizes, reports, backs-up and repairs clusters and assists with the overall maintenance to ensure continuous operational capabilities of the ICF catalog components in a z/OS environment. T-REX provides standard reports emulating IDCAMS LISTCAT output, but provides a much higher degree of selectivity coupled with high-speed performance. In fact, almost every attribute and characteristic of a cataloged data set entry can be used as selection criteria, including “Boolean” operator support for variable values. With a proper plan for implementing proactive diagnostics, T-REX provides a viable mechanism for detecting and reporting errors before there is a negative impact to production operations. The newest version of T-REX introduces numerous enhancements further easing the management of ICF catalog environments. The enhancements are split between z/OS 2.3 support and batch. Full support for 8-byte TSO user IDs. T-REX commands are now providing a message summary available to the PRTFILE DD and optionally to a separate SUMMARY DD. ICFRU now supports the AUTOSTART keyword to dynamically detect BCS back up and SMF data start date and start time. LISTCAT command now supports entry selection using DSNTYPE filtering. LISTCAT now provides the ALIGNDECIMAL option when using the DISPFMT facility. T-REX was developed by the original Softworks developers who devised the Mechanic and later Catalog Solution over 20 years ago. The developers applied their collective experience to incorporate modern design methodologies and technology to produce the latest, state-of-the-art catalog management product available. Additionally, the technical support staff is comprised of seasoned veterans of z/OS and the ICF catalog environment. T-REX can repair any VSAM object (BCS, KSDS and Variable RRDS) with a broken index within minutes.